Believed to have originated in Kashmir, the homeland of velvet fabric, painting on black velvet is considered by some to be tacky, while others view it as an expressive art form comparable to that of any other type of painting. Painting on velvet was originally practiced by early priests, who perfected techniques for depicting religious ceremonies and subjects. However, thanks to Edgar Leetag, who painted many velvet paintings in Tahiti and sold them to American sailors, the art form resurfaced and grew in popularity. 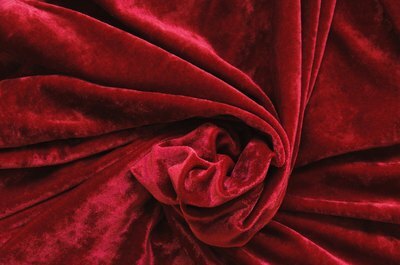 When purchasing velvet, it is best to buy the highest quality possible, with a lush texture. For maximum color penetration, purchase velvet with a loose weave. Velvet can be somewhat difficult for beginners to paint on, so some artists use velveteen, a softer alternative to velvet. Black velvet works best and draws out the brilliance of each color, but other dark shades such as red, green or blue work well too. Avoid using light-colored velvet as the color tends to fade quickly and does not give the paints the same effect that darker material does. Before beginning, be sure to wash and dry the velvet to prevent shrinking. When preparing velvet for painting, it helps to bond the fabric to a sturdy backing board made from thick cardboard or corkboard. Apply a quality fabric glue to bond the material to the supportive board. Other artists secure the velvet with staples or nails on the back, but the securing method varies according to the intended use. When creating fabrics meant for wearing, be sure to secure them in a manner that will not ruin the fabric, such as with embroidery hoops. Rotate the entire piece until it takes on a dark lustrous appearance; this ensures the threads are oriented in the right direction and makes painting and blending easier. For beginners, seasoned artists advise tracing stencils onto the fabric with a thin strip of white paint or chalk. However, most artists prefer to freehand their designs directly onto the fabric. Craft makers use rubber stamps and create impressions by lightly ironing the back of the velvet over a rubber stamp. Afterward, the artists use a bleach pen or a brush dipped in bleach to remove the color from the stamp detail on the velvet. Soak the velvet in vinegar to stop the bleaching process, hang to air dry, and then begin painting directly onto the bleached pattern. Some artists use oil paints while others prefer acrylic. Crafters prefer to use fabric paints. As with any art, the materials used are those that work best with the artist’s skill and subject matter. 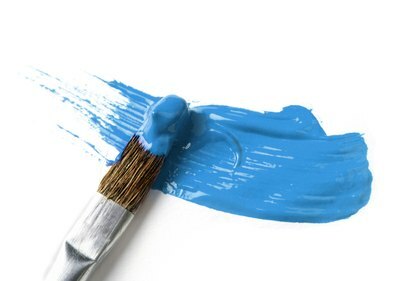 Paints do not require thinning and go directly onto the fabric by using a paintbrush or an airbrush or a combination of both. For oil paints on fabric meant for clothing, consider using a blotter to remove the oil from the paints to prevent staining. Be sure to work quickly as the paint dries rapidly on velvet, becoming increasingly difficult to blend. Protect and enhance paintings by applying a medium gloss over the paint colors.